This case study examines how alternative approaches to rinderpest eradication evolved in the complex emergency context of southern Sudan. The researchers also explore how initial experiences informed the establishment of a large scale community based animal health worker (CAHW) system. 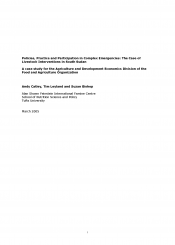 Within the Emergency Relief and Rehabilitation Division of the Food and Agriculture Organization (FAO TCE) or AGA there seems to be limited analysis of lessons learned from different livestock relief interventions around the world. With an emphasis on policy processes and actors, this case study reviews experiences during three distinctive periods: pre-OLS (before 1989), the initial period of community-based approaches within the livestock program coordinated by UNICEF (1993 to 2000), and the most recent period of coordination under FAO TCE.